Fooling around successfully it seems: it definitely has that "old time photograph" feel. Hi Andrew! Very nice!! I like the way you composed this photo, the perspective you shot it from is pretty cool! Your the man when it comes to these barn shots! I noticed all your snow is gone, is your area the one having the January heat wave? It is both well constructed and also very slowly being "reclaimed" by time and nature. It would be interesting to see a photo of the barn in its prime. 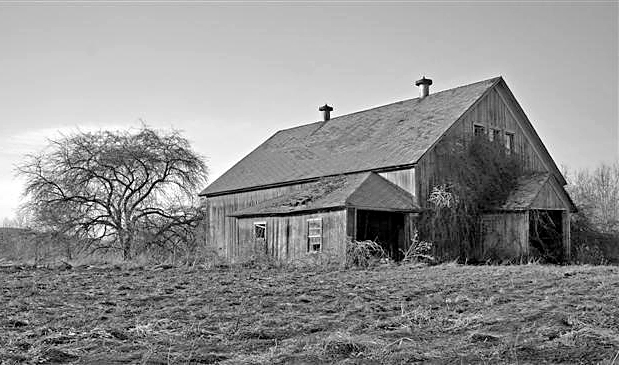 Then, say one or twice a year photograph the barn (presuming it is an abandoned structure). Cal it the life of a barn. This is a very nice, well-composed photo.